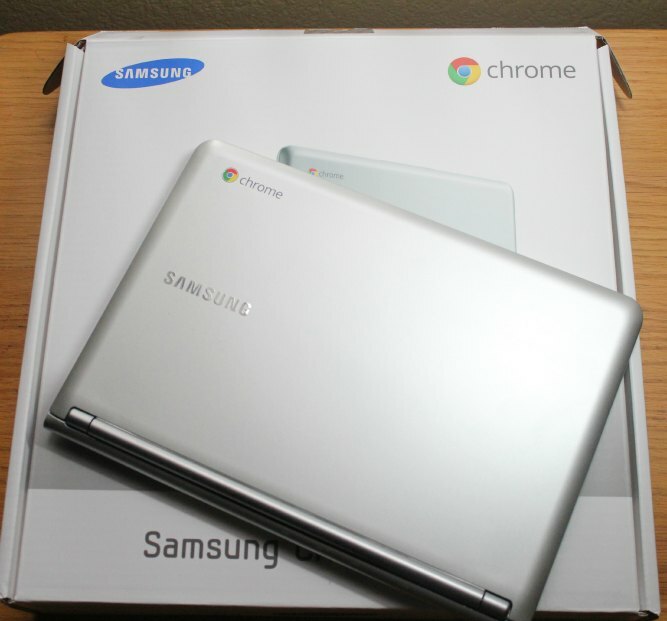 Disclosure: Staples provided me with a Samsung Chromebook for the purposes of review. All opinions and experiences are entirely my own. 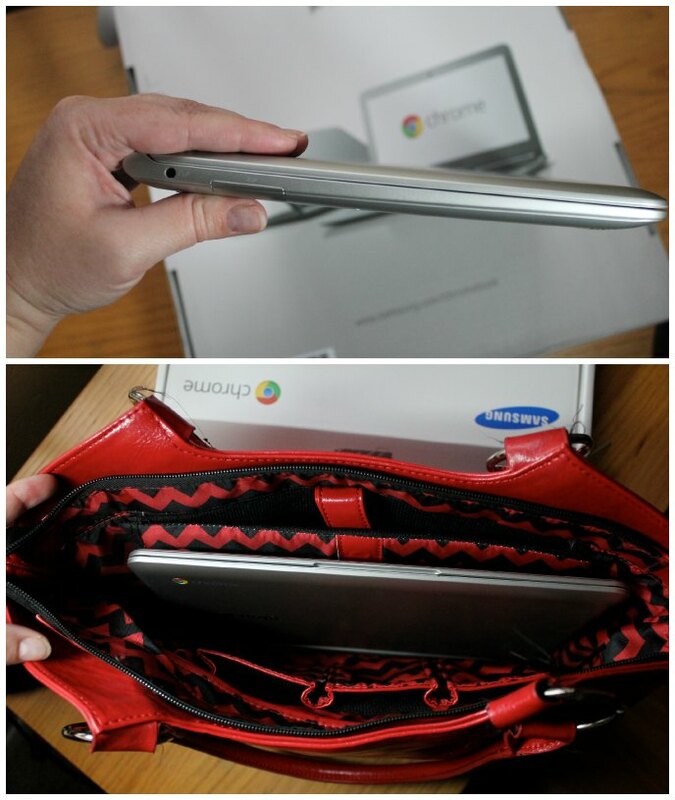 Are you familiar with the Samsung Chromebook? Honestly, until Staples contacted me about doing a review, I didn’t know much. I’d seen a few bloggers using them at conferences and knew it had something to do with Google, but I’d never paid them too much attention. You see, I’ve turned in to a “Mac girl”. We’ve got a household full of i-devices and I couldn’t image working on anything but my Macbook Pro. 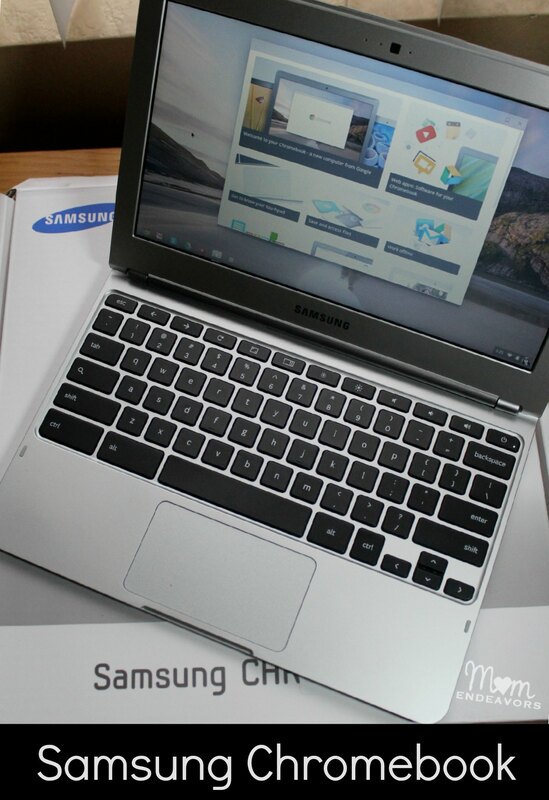 But, after being contacted, the $249 price tag of the Samsung Chromebook had me intrigued. Compared to the costs of traditional laptops and many tablets (and i-devices), that is a steal! So, since many parents are looking for an affordable computer option for their kids, I wanted to see if the Samsung Chromebook might be a good back to school option! So, what is a Chromebook? 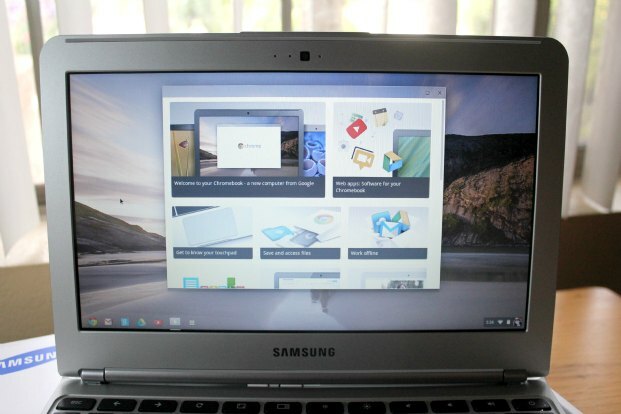 The Samsung Chromebook is a new computer that helps you get everyday things faster and easier. It starts in seconds, has virus protection built-in, and runs your favorite Google apps plus thousands more. At just 2.5 pounds, 0.8 inches thin, and with over 6.5 hours of battery life, the Samsung Chromebook can go anywhere you go. For those that don’t speak technological jargon, we’ll go through some other things to give you a feel for it! 😉 The Chromebook is the size of a “netbook” computer. It’s sleek and much smaller than your standard laptop computer. In fact, at first glance I thought it was just about the same size as a tablet, but it’s actually just slightly bigger. Given its size, it’s also really lightweight, making it SO much nicer to carry with me than my laptop! Take a look: That super awesome portable size is definitely one feature that makes it nice for students and for those that do a lot of traveling (probably why I’d seen some bloggers with them at conferences 😉 )! But, what about functionality? With any new computer, the first thing is the set-up and sometimes it’s a huge pain. I’m not tech savvy that way and was honestly not looking forward to messing with the set up of this. But seriously all, I’ve never set up anything technology-wise that was easier. Just plug it in, put in your google account information (or set one up if you don’t have one already), and that was basically it! Really! Then, it walks you through setting up a few of your preferences and shows you where everything is! Plus, there are some great bonuses included! Travelers will love that the Samsung Chromebook from Staples comes 12 FREE passes for Gogo in-flight internet that you can use for 2 years on domestic flights! 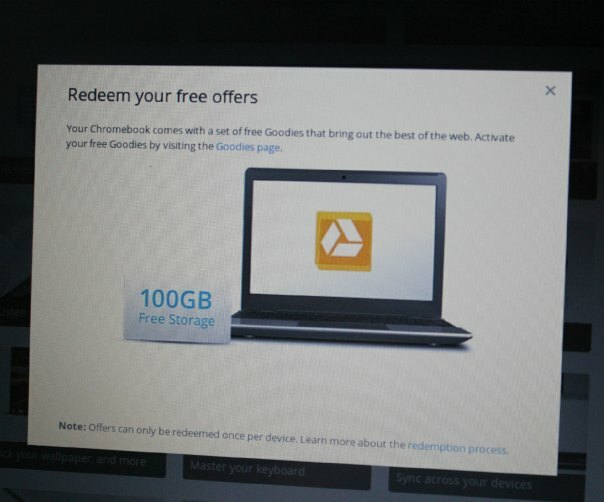 And, it also comes with 2 years of 100GB free storage on Google Drive! Awesome!! And, once again, talk about affordable! Both of those perks add up to some huge savings! So, once I was all set up & had redeemed my free offers, it was time to play with actually using the computer! The hardware on the computer is simple yet functional. Keyboards sometimes really bother me, but I felt really comfortable on this one. And, the touch pad is what I’m used to on my Macbook. So, that was easy too. As for ports, it has just about everything you would need for basic functions (card reader, USB, headphone, HDMI, etc). The software is where things are really different. There really aren’t programs that most of us are used to whether it be on a Mac or PC. So, you’re not installing things like Photoshop, Office, Word, etc. Instead, it runs off Chrome apps and Google programs. That might sound strange or complicated, but it’s not at all. 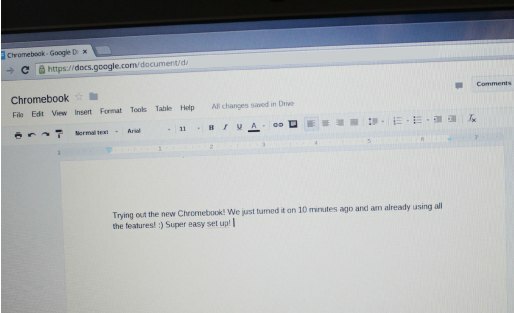 Within just a few minutes, I had already created a Google doc and had it saved in my drive! And, I can access those files from any other device that I can get into my Google docs through! Super easy! If you’re looking for something simple (like say for a beginning computer user), this is perfect. So, for students that need something to do some web browsing for school stuff and have writing capabilities, this would be a great buy. I also think that for people that just want a very simple computer (like our granparents 😉 ) to do email and maybe a couple favorite websites (like this blog ;)), this is a really good possibility. It’s also perfect for those that are on-the-go a lot (like bloggers, business travelers, etc) and want something that they can sync to and access from mobile devices, on other computers, etc. There are times for me when traveling that I don’t really need my full laptop capabilities, but I need something more than a tablet can do. This is perfect for that! And, in fact, that’s what I’ll be using it for right now. Then, down the road, I think Big Brother will be working with it. The Samsung Chromebook does NOT replace the functionality of a traditional laptop, but it’s a really great option if you fit into any of the “categories” above. And, with a $249 price point at Staples, I think it’s an affordable investment for many families with some great applications! 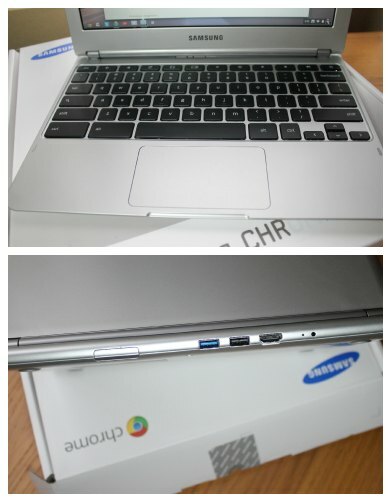 Are YOU familiar with the Samsung Chromebook? Would you have any application for one in YOUR family? I just heard about these the other day. They look great! I love how small it is…makes it easy to take it along! Fantastic review! I think it’s a great value for the price. Um . . . that is awesome. Perfect for my purse and when I need a computer on the go!